Trip & Co also delivers the following hardware products: stud fittings, single studs, double studs, rings, buckles, cam buckles and hooks. We always test these products according the latest norm, prior to deliver. Hardware are very small, but very important items. An entire air cargo restraint scheme, holding down many tons of cargo whose movement would present a major risk to the aircraft, can be dependent on the strength of hardware. 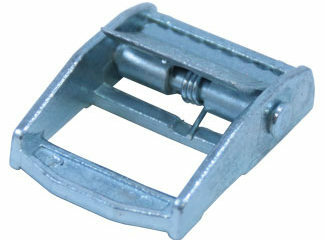 With the single stud fitting you quickly create a secure tie down point. The large ring accepts a wide variety of hooks, snaps, and straps. Cam buckles are often used for light and fragile cargo. An overcentre buckle is perfect to use for jobs that require a quick handling. The design also allows the webbing to create a layter of padding between the buckle and the cargo. The ratchet is frequently used in heavier straps with HW polypro webbing , nylon webbing, and polyester webbing.